THIS LOCATION IS TEMPORARILY UNAVAILABLE If you have a desire for an out-of-the-ordinary venue, TO&A offers our court reporting clients a setting like no other. In a retreat-like atmosphere, you can hold your deposition at Kellogg West Conference Center, located on the grounds of what was originally a ranch belonging to cereal magnate W.K. Kellogg. It was on this ranch that Mr. Kellogg bred his fine Arabian horses. Kellogg West sits among one of California’s last remaining natural black walnut groves in a natural setting of singing birds and various species of wildlife. All of TO&A’s conference/deposition rooms have floor-to-ceiling windows providing beautiful scenic views. 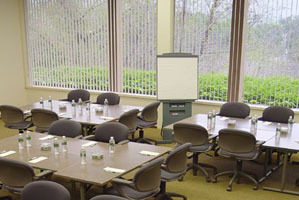 Other amenities include eight-hour lumbar support chairs, specially designed conference tables, high quality lighting and sound-proof walls. Videoconferencing, an LCD projector, wireless and high speed internet, and on-site administrative, technical and fully trained deposition support staff are available to all clients. Full-service hotel rooms and a full service restaurant are also available for your convenience.